Photo right: Clergy couple, Rev. Bess Perrier and Rev. 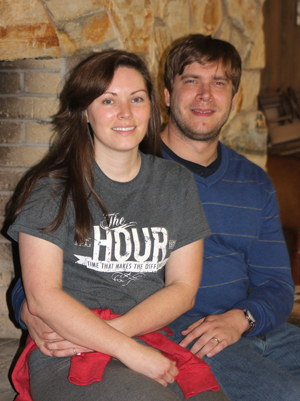 Austin Hoyle has three small children and serving at different churches. 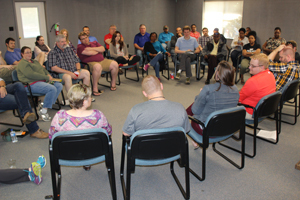 Photo below right: Residency in Ministry participants during a discussion on balancing family and church. Photo bottom right: Guest lecturer, Dr. Don Saliers is the author or co-authored of at least 10 publications. Never say, never -- is the message that one can learn from the Rev. Bess Perrier, pastor of Cedar Lake United Methodist Church in Biloxi, Miss. Her husband is the Rev. Austin Hoyle of Gautier First United Methodist Church in Gautier. The distance between their churches is about 17 miles. "I have always said, I was never going to be a pastor and was never going to marry a pastor. And then I married Austin," said Perrier. "We've done a pulpit swap already. They (the church members) say, 'Austin we like you, but we love your wife,'" said Hoyle cheerfully. Recently the couple attended a Residency in Ministry (RIM) retreat with about 35 other clergy. RIM is a three year program designed by the Mississippi Conference Board of Ministry to provide provisional members of the Mississippi Annual Conference with support and guidance that will nourish continued theological education, spiritual formation and practical skills for ministry. "Provisional members are on trial in preparation for membership in full connection in the annual conference as deacons or elders. They are on probation as to character, servant leadership and effectiveness in ministry" (Book of Discipline). Perrier is at the beginning of the RIM process and Hoyle is at the end of it. "He is a guide for me. He's very organized and administratively minded, I am not. So the process for him was easy. He's helped me discern paths best for my gifts. He's just really encouraging," said Perrier speaking of Hoyle. The way the clergy couple supports each other is exactly what the board of ministry wants for all of those in the RIM program. The participants are encouraged to bond, stay connected and assist each other. At age 60, Rev. Dexter Ware is in the program. He said the mentorship component of RIM has been a tremendous gift. He is a former Southern Baptist preacher who converted to United Methodist. Ware currently serves at Harrisville and Rexford United Methodist churches. "I felt The United Methodist Church focuses more on grace and I really appreciate that. I found a lot of affirmation in the RIM process and one of the things I really enjoy is the mentorship, the acceptance and the support I get from my district superintendent," said Ware. 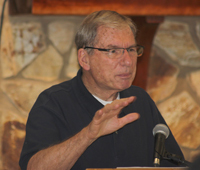 Dr. Don Saliers, distinguished author and professor of theology and worship was the guest speaker for the RIM retreat. He has made several presentations to various groups related to the Mississippi Conference over the years. On his last visit, he was in concert with his daughter Emily Saliers. Many may know her as part of the American folk rock music duo, Indigo Girls. Saliers stated that when he comes to Mississippi, his eyes and ears are always open for social progress, and justice work and explained why this is case. "First of all it has difficult history, but also there is a surprising resilience in Mississippi. Not everywhere is equal but there are some really good things going on here and the church has to be a part a big part of that," said Saliers. He also summed up his advice to RIM attendees, "Support one another in faith. Get a real substantial sense of your own spiritual disciplines, because they are going to last your whole ministry long. See that you are a collaborative person and that you work with others in a way that is fruitful." The RIM retreat was held at Camp Wesley Pines in Gallman, Miss.